The Tchefuncte site is in the coastal marsh of southeastern Louisiana. The main excavations at this large, prehistoric site were in the late 1930s and early 1940s. They were crucial for understanding how American Indians in the area lived during the Early Woodland period. This was the first era when people commonly used pottery for cooking and other daily tasks. (Below) Artist's rendition of daily life at the site. Painting by Jack McLehany, courtesy of Guaranty Corporation. 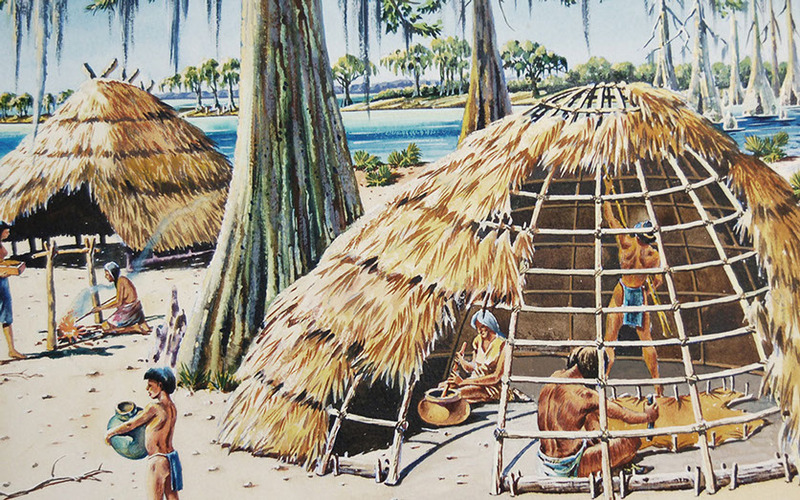 Archaeologists call those who lived in this region during that time the Tchefuncte culture. The name shows that much of what is known about the people came from the Tchefuncte site. This site provided a rich record of how the group that lived there used the resources around them to create a good life. Be sure to click on or scroll over pictures to get a better view!